Ladies and gentleman, the Smithfield-Selma Chamber is again excited to present the prestigious Athena Award to a well-deserving recipient. This award celebrates the potential of all women as valued members and leaders of the community and honors individuals who strive toward the highest levels of professional accomplishment. Tonight’s recipient is a fierce advocate for acknowledging female potential and just as importantly doing what needs to be done to make this community and the world we live in a better place. 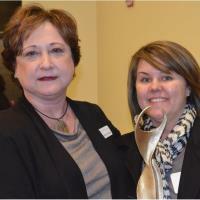 The Athena recipient must demonstrate excellence, creativity and initiative in their business or profession: Check. And, she must assist women in reaching their full leadership potential: Check. Our nominee and winner graced Johnston County with her presence in 2007 to open Carolina Drug and DNA Testing in Selma. Her purpose was to fill a perceived need in Johnston County by providing the court system, businesses, and individuals a resource for drug and DNA testing. After establishing the business, she joined the Greater Smithfield-Selma Area Chamber of Commerce and has become actively involved in promoting commerce—and women’s ability to greatly influence the bottom line— in the greater Smithfield and Selma areas. She then shared her charitable philosophy by creating the non-profit organization Reach Out Johnston County (ROJC) in 2012 to provide the nonprofit community with educational opportunities, board and staff retreat facilitation, fundraising consulting, and business connections. During the federal shutdown in October 2013, she rallied nonprofit leaders to meet with a local News and Observer reporter to reveal how the government shutdown had strained federally supported services in Johnston County. Our recipient has become a strong partner to the Small Business Center at Johnston Community College by teaching drug awareness and nonprofit seminars for business owners. Through the Corporate Training unit at JCC, she developed a Nonprofit Management program. Her community service efforts in Johnston County are unparalleled. Where she sees a need, she seeks to fill it by taking the baton and engaging those with like minds to make a difference on behalf of our community. She has served as Public Relations Director on the Harbor Board of Directors, has organized sexual assault training for law enforcement officers, and has worked with Harbor’s Walk-a-Mile event and lent her organizational skills to its annual Valentine Ball for many years. In 2011, she lent her support to the Boys & Girls Clubs of Johnston County to promote an upcoming art action fundraiser. The following year she joined the Club’s Board of Directors and served as the co-chair of the art auction fundraiser. We think she would say her greatest accomplishment for the women of Johnston County is the creation and building of the Chamber Women’s Business Network. In 2012 she challenged CWBN to surpass the $5000 mark in 2013 in the scholarship funds raised. With her hard work and tenacity, that goal has been achieved. CWBN is currently gearing up for its 4th year of scholarship awards. In addition to the scholarship dollars raised and awarded, the CWBN has brought many women within and outside of the Smithfield Selma area together to strengthen themselves, share resources, and be inspired through the division’s events. Sherry Harris is originally from Wake Forest, and lives in Cary with her husband Dan. They have 2 children, 4 grandchildren and 1 great grandchild. Her words: “I must stay busy...it's natural for me...so I have my fingers in many pies! But, of course, I also love relaxing, reading a great book, enjoying the sounds of all types of music, and having dates with dear hubby. I love Wrightsville Beach, Atlantic Beach, Pinehurst, Boone (NC) and many US spa resorts!” Sherry Harris is most deserving of the Athena Award. She is generous with her time, selfless in her dedication to our community, and forward-thinking in what should happen next, often before we know it ourselves. She embodies all the values of Athena, excellence, creativity, initiative, devotion of time, talent and energy to improve the quality of life for others in the community, especially in assisting women to reach their fullest potential. Will all who feel that Sherry has positively impacted their life please stand. Thank you!! !